I've been contacted a few times before about doing reviews or giveaways on the blog, but most of the time the product or service hasn't been something that fit with my life and therefore this blog. So I say no. Recently though, I was contacted by a very nice publicist who told me about the book Bringing in Finn. Its a memoir that involves a mother's unusual journey to her son. It involves miscarriage, baby loss, and surrogacy. Not all fun topics, but ones that have in some way been a part of my life me. I was definitely interested! 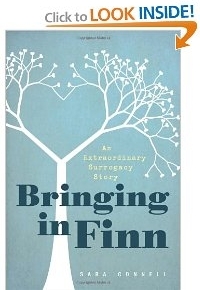 Bringing in Finn is the incredible story of one woman’s hard-fought and often painful journey to motherhood. In this achingly honest memoir, Connell recounts the tragedy and heartbreak of losing pregnancies; the process of opening her heart and mind to the idea of her 61-year-old mother carrying her child for her; and the profound bond that blossomed between mother and daughter as a result of their unique experience together. Moving, inspiring, and ultimately triumphant, Bringing in Finn is an extraordinary tale of despair, hope, forgiveness, and redemption—and the discovery that when it comes to unconditional love, there are no limits to what can be achieved. I'm so glad I said yes to this book review. Bringing in Finn is such a moving story; Sara does such an amazing job of getting her emotions onto the page that you are immediately pulled onto her roller-coaster. Despite knowing that it was coming, I couldn't help but cry when she lost her twin boys. It isn't all heartache though, as you also get to experience the amazing highs of finding out they are pregnant and ultimately the birth of their son, Finn. From the moment I started reading, until I turned the last page, I couldn't put this book down. Sara is a wonderful writer, making it a fast, easy read; and you want to know what happens. I would definitely recommend this book to anyone, but especially to those who have dealt with pregnancy loss, or are considering surrogacy. I was lucky enough to get the chance to ask Sara a few questions too. Meegs: What made you want to share your story? Sara: Part of the reason I wanted to write this book was to break the taboo about fertility and pregnancy losses. When I’d hear there was such a taboo, I didn’t believe it and yet, I found myself - as I was going through fertility treatments and especially miscarriages and the death of our twins - that I didn’t want to talk about my experience. I didn’t even want to talk to the very close loving friends I have. I felt ashamed and dysfunctional and in reaction, I isolated myself. I’ve heard from many women in my private practice and since writing the book who felt the same. I hoped that in writing this book, I would do for someone else what so many of my beloved memoir writer’s have done for me - to share honestly, to be candid and raw, to not hold back and in doing so, share healing and transformation. I also found that while my journey to having a child did not look the way I imagined, it also opened me to the miraculous in life - the miraculousness of the female reproductive system, the miracle of infinite possibilities - the way solutions and ideas can come that are beyond what we could have conceived on our own. I wanted to write about that. M: Was it hard, healing, or something else entirely to open up so much and write it all out? S: The hardest part for me was writing about my family (what would they think? Would they be upset at my mention or interpretation of certain events?) and about the loss of our twins (writing the first draft of chapter 6 required me to viscerally revisit, felt like relive, certain excruciating moments). With each draft, I had more objectivity and while I didn’t write the book for a cathartic purpose (I turn to journaling for that), those same sections and the process of writing was unburdening and freeing. M: Your previous traumas obviously played a large role in your story - both because of questions about whether those traumas played a part in your troubles getting pregnant, and because of the additional stresses they created when you were in the hospital. Was it hard to share those traumas? S: Similar to the answer above, writing about these experiences were both healing and difficult. I am also a life coach/therapist and in my training I learned over and again that speaking/naming and sharing a trauma out loud frees us from it. I wasn’t sure how strongly I believed in the phenomenon but I can say I feel more transcendence each time I write. M: I believe you have one frozen embryo left, would you consider using another surrogate to try to have another child? S: Bill and I have always envisioned and felt we would both love to have more children AND feel so incredibly blessed with Finn that in this moment we are standing in a place of openness - the most honest answer I can share is that I/we don’t know. I don’t think we would do another surrogacy pregnancy - not because our experience wasn’t wonderful, it was and beyond - but I think what we feel most called to if we do try for another pregnancy would be for either me to carry the baby (there is a new procedure we learned about since the twins pregnancy called a trans abdominal circlage for women who’ve had a cervix issues like I did that has almost 100% success rate) or adopt a baby/child. M: Can you give us an update on your family? What's life been like since Finn arrived? What's motherhood like compared to your expectations? S: Motherhood has exceeded my expectations and imaginings in so many ways. I think I spent the first nine months in a kind of euphoria and glee - the lack of sleep, exhaustion, radical upheaval of life - logistically as we know it - felt like intense bliss. I still feel a lot of that, and I now experience some other feelings too - shock (at how so much has changed), fatigue, pressure (in response to the perpetual and universal questions of how to find balance, “get everything/things done” be an write/wife/mother/friend/daughter/sister/coach +++”). Being with Finn and together as a family is the antidote. I have the gift of being self-employed so I work part of the day and spend large amounts of the day with Finn. He is 20 months now and we are into all the parent-baby classes: Gymboree, music, swimming, baby soccer, museums - Chicago is amazing for kids. Mother is #1 on the list and happily, the underlying and consistent emotions are wild gratitude and joy. My mother is doing awesomely well. She is back at the gym and on her bike working out. She and my father just booked a trip to France. She visits (or we do) every month or two (my sister also lives in Chicago and also had a baby (another boy) last year - so it’s a double thrill for her to come. And she just led a retreat at her church on visioning - the technique we did so much together leading up to and during the surrogacy. M: One last question, did you and your husband ever name your twins? If so, would you be willing to share their names? They play a very large part in your story, it made me wonder if I could call them by name. S: Thank you for asking - it’s a lovely question. We had not decided on names for the twins. We’d begun looking at names and had pretty well chosen one. When we think of or mention them now, we most often call them “the twins”. M: Thank you again for sharing your story. Let me know if you get a chance to read this wonderful book, and what you think of it. Wow, this book sounds very moving. Pregnancy and baby loss is so hard to talk about. Even though I have gone through it, I don't like to think about it much.